It has been a really long time since I’ve written anything for the site. January was a bad month for me… not for design, in fact, quite the contrary… but mentally. I spent the entire month in a mental funk that left me fairly anti-social. The odd part for me was that I actually got stuff done during this mental “down time.” Usually, when I’m depressed, I don’t have any creative power or drive… but this time around, I actually finished an old design and designed something brand new! Today, I have released another game on thegamecrafter.com and this time, it’s my re-theme of Princess Dice! So many people have played this game over the past nine months and given me great feedback. I originally designed it as a simple dice game for me and my girls to enjoy. It worked great, but had many quirky flaws. I started the re-theme around Christmas because I wanted to pitch this to more publishers than just toy and family publishers and… well… I’m a former Marine. I always wanted to design a game about the Marines. In fact, the mechanics fit this theme much better than they did Princess Dice. I’m not done with the original version however. I’ll be pitching both versions of the game to whomever will listen, but for now, you can get your own copy directly from The Game Crafter! Their service is awesome and the product is really nice. At the same time, The Game Crafter released this awesome little telescoping box that is fully wrapped in beautiful full-color art. I desperately wanted to design a game in this box from the day it was announced… but it’s so small! I started digging through their extensive parts catalog when I came across the tanks. – I grew up with Car Wars… loved that game… what if I could do something like Car Wars, but with the tanks figures? – I remembered Car Wars having printed maps, what if I made them modular? – What if I combined this idea with a Wings of War or X-Wing Miniatures type movement mechanism? – What if, each turn, you select your movement and fire cards like RoboRally? Tuesday Night Tanks was born. It is set in an alternate present-day where tank combat became an arena sport… the most watched sport in American History. It has tested well so far, but I’m not quite ready to release it to the public yet. After The Game Crafter contest, I will open it up for sales. I have quite a bit planned for the future of this game and the universe it is set in! Hedeby development has stalled. Not because the game isn’t good, but because I needed to take a break to figure out how I wanted to proceed. I think I have that figured out and work has begun to update the game to version 0.9. 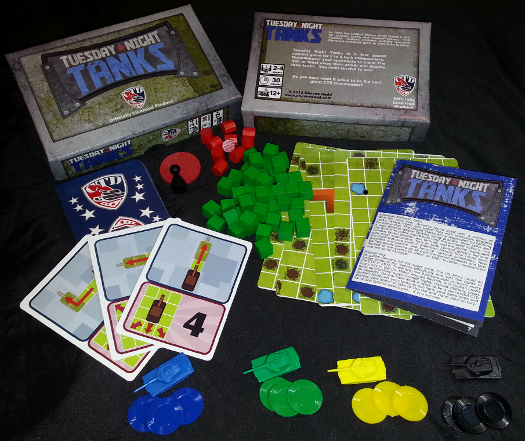 I will be attending ProtoSpiel in Milwaukee, WI March 9th and 10th and will be showing the game there. I’m going to stay quiet about it until that point because I really feel that I just need to tackle this update without outside influence. Also debuting at ProtoSpiel is an all new edition of Dead End!!! One of my awesome (new-ish) online friends, Neil Roberts, has taken this game on as a project to fix it. He’s made some awesome changes and he will be bringing it with him to ProtoSpiel. I think I’m more excited to be back on this project than any other. I know little bits about his changes, but have purposefully avoided any in-depth analysis. When I play it in Milwaukee, it’ll be all new to me. Can’t wait! That’s about it for now. I’ll be back next week with a more in depth look at Tuesday Night Tanks!